“The ideals of education, whether men [sic] are taught to teach or plow, to weave or to write, must not be allowed to sink into sordid utilitarianism. 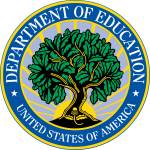 Education must keep broad ideals before it, and never forget that it is dealing with Souls and not with Dollars.” 1902, W.E.B. DuBois, educator and civil rights leader. Not a day goes by where a charter school controversy or scandal is not exposed in California or the rest of the nation. The frequent media coverage of charter school misconduct exposes how the increasing privatization of our public education system has turned our current educational landscape into a laughable charade at the expense of our children’s education and their overall well-being. New and growing research is mounting regarding the consequences of not having strong oversight, transparency, and accountability over charter schools, which includes increased corruption and educational dishonesty. Taxpayer dollars are filling the bank accounts of those who manage charter schools which is evident as research by In the Public Interest and the Center for Popular Democracy that exposed the financial fraud and corruption running rampant in these schools. In California, $6 billion of public funding has been funneled into charter schools and their respective management companies leaving public schools starved for required public monies. The fact of the matter is that the charter school movement has failed as a method of education “reform” as it has not lived up to the promise of being laboratories of innovation, high achievement, and increased educational opportunity. Research shows that overall the presence of charter schools has resulted in increasing educational segregation, continued decrease in public school funding and biased student exclusion practices (ACLU and Public Advocates Inc., 2016). One of the exclusionary practices of charter schools, as research conveys, is actively discouraging families from enrolling disabled or special needs children or counseling them to leave because the school is not a good fit for their special needs child. Rather than making accommodations and providing the required services and supports, charter schools abandon special education students because they simply do not want to spend the funds on a highly regulated component of public education. All the above mentioned charter school improprieties are not exemplification of the benevolent contribution that charter schools were to impart upon the public education arena. If anything, quite the opposite is true. The charter school movement grew in strength in the early 1990s as legislative educational policy legalized the empty promises of charter school reform as it was lauded as the panacea to cure all ailments of “government schools,” i.e. public schools. The popularity for the privatization of the public education system, via charter schools and vouchers, was facilitated by the disappointment from the perceived dismal performance of public schools as exposed by the Nation at Risk Report in 1983, which called for the urgency of educational reform. The twisted belief that anything was better than a regular public school due to their ineffectiveness and overall failure to increase student learning grew in acceptance and eventually became a manufactured social truth. Proponents argued that charter schools would increase student learning and achievement all while empowering parents with the freedom of school choice. However, the empowerment is only for a chosen few as increasingly every year many communities and schools are segregated along largely racial and socioeconomic lines. Research strongly points to the direct correlation between a high degree of school segregation and the widening of the achievement gap. Charter school proponents argued that charter schools would be held accountable by performance, in other words on academic achievement. The contention rested in the notion that if a charter school was not producing high academic achievement via test scores than school closure was an imminent result. However, that has not been the case for current low performing charter schools. Low performing charter schools can continue operating as long as the charter industry funnels enough money into elections to influence those who are supposed to provide oversight. In reality, only “About 32 percent of California charters outpace the learning impacts of TPS [Traditional Public Schools] in reading, and 29 percent do so in math. Still, 21 percent of charter schools have results that are significantly worse than TPS for reading and 37 percent of charter schools in math are underperforming… The larger question of whether charter schools are helping students achieve at high levels is also important. Thirty percent of California charter schools have below-average growth and achievement in reading, and the same is true for 42 percent of the charter schools in math. Students in these schools will not only have inadequate progress in their overall achievement but will fall further and further behind their peers in the state over time (CREDO, 2014, p. 40).” These underwhelming results are skewed by the fact that charters can cherry-pick high achieving students, serve fewer students with extra educational needs and have parents who are more motivated to seek options for their students and tend to be more involved. The main reason a charter school is terminated by their charter management organization (CMO) is due to low enrollment, which translates into low economic growth, i.e. profit, causing the administration to initiate critical decision-making process, i.e. the exit strategy, to determine the fate of that charter school franchise in their offices miles away from the schools and communities they supposedly serve. The decision to close a charter school can come at any day when fear of budget nearing the red is looming. Once a charter school is not making a profit for the CEO and the directors, the verdict to cease its schooling life is an easy one to make, no matter if the school is high achieving or not. The easy exit strategy for many charter schools is filing for bankruptcy, which also translates into educational bankruptcy for the parents and their children as well as they are left in the dust as the doors close behind them. Charter school board of directors are not beholden to the parents, students or teachers they allegedly serve and employ, but to the interests of the corporate stakeholders that want to see growth and profit, not under-enrollment or increasing educational costs. The goals of public education and the business model of charter schools are counterproductive to one another as the goal for charter schools is to keep costs low and profit increasing, while in public education money must be spent to obtain the services and resources a student requires to address their educational needs. The deregulation of the charter school network system provides for the creation of a more complicated and dangerous structure called the super-network. In addition to examining the effects of charter school networks, the Center for Research on Education Outcomes (CREDO) examined larger organizations called super-networks. CREDO introduced the concept of the super-network in their 2013 Charter School Growth and Replication Study. A super-network can be considered as a network of networks that can serve up to tens of thousands of students through their multiple organizations. A super-network is distinguished from the number of multiple organizations managed at one time; so, the higher the amount of charter school-related organizations super-networks manage, the larger and more powerful they become. “Super-networks have a hierarchy of institutions which require more complex management structure whether it be operating multiple similar networks across the country or operating multiple brands of charter schools each with its own objectives.” (CREDO, 2013) As the deregulated charter school industry grows in strength and power, our public education system will cease to be in the hands of the people and more in the control of the “invisible hand(s)” of the free-market system. In the end, the main victims of the charter school movement and growth have been parents and students, particularly from low-income and working class families and minority ethnic groups, students with special needs and the list goes on. Being left in the dark with no assistance on who to turn to or how to proceed after being bamboozled by a charter school is an emotional turmoil that is completely unnecessary and avoidable. The parents must quickly scramble to look for another public school nearby before all seats are taken. The child is traumatized and depressed because their school and teacher they looked forward to all summer no longer exist. The child is disconnected from any social network and resources needed to succeed. Both parent and child are left with their hands in the air asking themselves what happened, where do we go from here and how we can trust the charter school educational system again. The problem with viewing schools as a business is that it doesn’t consider the human essence that is the life source for schools and education overall—our humanity. When a charter school lures the local child to their classrooms, it tears away little by little the ideals of the civil rights movement and along with it the strength of the community, i.e. the people. 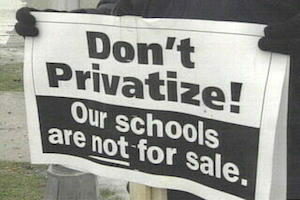 The privatization of public education destroys the community and relationships established around trust, connection and comradery nurtured in our neighborhoods and public schools. 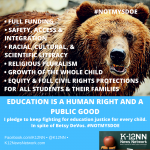 Public education is the sacred life source for social justice and democracy to prevail during the political, social and economic neo-liberalist institutional transformation, i.e. the corporate way. Undoubtedly, education is the bastion of economic mobility and advancement for all, particularly individuals and families within the low socio-economic and poverty strata. And yet the state of public education in our nation is now even more fragmented and complex than ever before thanks to the neo-liberalist ideology that believes in leaving public education in the hands of the private business world because of its supposed intrinsic superiority, effectiveness, and efficiency. But nothing can be further from the truth because privatization of public education in and of itself is anti-democratic as it penalizes the people, namely our children, the working-class, taxpayers, the poor, people of color, and all our nation’s most vulnerable. As research has demonstrated with images and news from media coverage regarding charter school unethical behavior and scandals, the charter school management companies have not proven to be producing better results than public oversight. The push for market models and devolution of public authority has been co-opted by a vast amount of corporate interests through their funded education foundations, charter school management organizations, and astroturf parent advocacy non-profits, such as Speak Up, Parent Revolution and Families in Schools, to name a few. 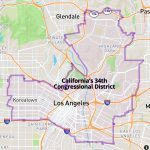 As long as the charter school network system remains deregulated and dirty corporate and billionaire money continues to control elected officials, the fight for our democratic civil rights remains a constant struggle, which means that the survival of public education is in the hands of the people, the defenders of Democracy. It is with our voice and vote to demand that our public education system remain under democratic control and reject selling our children’s education to the highest bidder. Center for Public Education, January 2017. “School Segregation Then and Now: How to Move into a More Perfect Union.” Author: Chadl Wagner. The Civil Rights Project, February 2017. “Our segregated Capital: An Increasingly Diverse City with Racially Polarized Schools.” Authors: Gary Orfield and Jongyeon Ee. Dr. Rocio Rivas is a mom, educational researcher/analyst and a community leader. Dr. Rivas holds a Doctorate from Teachers College, Columbia University in Comparative and International Education with a Political Science concentration. She has travelled throughout the world researching education internationally in her native Mexico, Argentina, Chile, Republic of Georgia, Tanzania, and Bolivia. 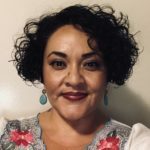 Dr. Rivas has worked for LAUSD as an educational researcher in the former Program Evaluation and Research Branch (PERB) and a community representative at a public school in Highland Park. Additionally, she has served in a variety of school leadership roles, including chairperson of School Site Council, parent member of the Local School Leadership Council, and parent ambassador to the Local District Central Superintendent’s Parent Collaborative Meetings.